If you're looking for a tangible way to convey thanks to volunteers, ministry team members, or staff for their service, this personalized plaque is a wonderful option. 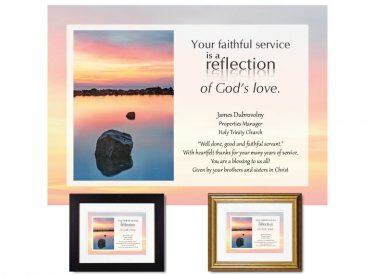 Stunning imagery of reflections at daybreak off New Hampshire's Atlantic coast pairs beautifully with the message: Your faithful service is a reflection of God's love. You'll personalize this memento with the recipient's name, job title, and the name of your church or organization....along with own special sentiment. Framed & Finished - Printed on premium paper with archival inks and then double-matted with conservation-grade matboard as above; mounted using acid-free foam core backing; framed using distortion-free UV acrylic glazing. A protective dust cover and wall guards are applied to the back. Your choice of eco-friendly black or gold wood frame (view frames here); ready to hang. Finished size: 10"x12"